The 48.2 metre motor yacht Lady Ellen II, listed for sale by Burgess, has had a price reduction of €700,000. Designed by George Nicholson, Lady Ellen II was built in steel and aluminium by Italian yard CRN and was delivered in 1996, and has since received several subsequent refits and upgrades. Lloyd's classed and MCA compliant, her elegant Francois Zuretti interior is beautifully crafted in cherry wood and burled ash with luxurious neutral fabrics and leather, offering large volumes. Accommodation is for up to 11 guests in six cabins consisting of a full-beam master suite, VIP suite, three twins and a single ‘nanny’ cabin. All guest cabins have entertainment centres, television screens and en suite bathroom facilities while the crew quarters sleep 10 crew aboard this yacht for sale. On deck spaces are generous with a variety of open and shaded spaces for enjoying meals and socialising. Her large sundeck offers a relaxing combination of a spa pool, sunbathing pads and a bar area, while the satcom arch with an awning attached provides welcome shade. She underwent a 24-month, multimillion-euro refit at Compositeworks in La Ciotat, France, which was completed in August 2015. She received a full hull restoration, restored teak decks, revamped technical spaces including zero-hour engines and a full repaint. She also now benefits from refitted crew quarters and a new audio/visual system. A further refit as recently as 2019 saw her teak decking replaced. Powered by twin 2,068hp Deutz engines that give her a top speed of 17 knots and a cruising speed of 15 knots with a 4,000 nautical mile range, transatlantic passages are well within her compass. 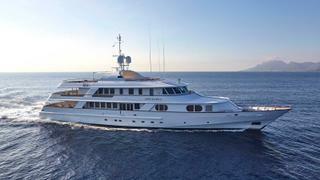 Lady Ellen II is now asking €7,500,000.